I started writing this post over a month ago. I was having such a hard time writing and spent an hour in front of the computer and only managed to write the first three paragraphs. Then something too close to home happened. Sadly, a dear friend passed away suddenly and unexpectedly. After that I had no desire to sit and write this post because I knew my friend’s loss would find its way into my writing. This whole post started with the passing of my dear friend Cathy’s mom. We attended the funeral, first going to the burial at the top of the hill in Green Hills Memorial Park. This is a beautiful cemetery and the location of the grave had a gorgeous view of Port of Los Angeles and the surrounding areas. After the burial we went to Cathy’s house where a delicious buffet of food awaited us. For the occasion I made Halvah. I have always loved Halvah as it is such a delicate and delicious sweet. Unfortunately, for the most part you end up eating Halvah at funerals as this is the ceremony that this dish is mainly associated with. I suppose you could make it on your own if you wanted to but seriously, it has always bummed me out that such delicious dish is made and consumed under such unfortunate circumstances. While in Iran I went to very few funerals, as I was very young. But I can tell you this, from a child’s prospective they were awfully traumatic. Everyone is dressed in black and the mourners are not shy about displaying their sorrow. What I mean is that there is a lot crying. The set up for each funeral usually was the same, chairs were placed around the circumference of the room. The guests quietly interacted with each other and kept their voices low. Family members or close friends of the family would walk around and offer guests tea and sweets, amongst which was Halvah. I was completely intimidated by the whole process. I think what made it so traumatic for me was the fact that there was such a public display of sorrow, which I am OK with, but it always felt like it was over the top, simply said it was very dramatic. I always wondered if they did that on purpose, just to show that they were really really really heart broken. There was such a immense sense of loss and agony expressed by the mourners. It felt as though any moment they were going to faint from the intensity with which they whipped and rocked back and fourth. Of course there would always be family members and friends who sat close by and comforted the mourners, nevertheless, it felt as though the oxygen would ever so slowly sucked out of the room. The whole room was filled with the very low whispers of those sitting around and the loud cries of those who were close to the deceased. Dra.Ma.Tic. Years later I attended my very first “western” funeral here in LA. Wow, what a difference. The loss was under such a sad circumstance and I was expecting the worst. A family friend’s twenty something son had accidentally shot himself while playing “Russian Roulette” with his gun. People mourned during the burial and then during the post burial gathering people actually interacted with each other comfortably. Conversations varied from reminiscing about the person who had passed away to other non-related conversations. There was laughter when talking about some happy memories. And OH. MY. GOD, they played music. Let me repeat this: they played music. Not any type of music mind you, but the kind that the person who had passed on liked to listen to. Playing music at a Persian funeral is unheard of. I am mean if anything, it is such an insult to the dead and the family. Upon my friend’s passing a memorial service was held for him. It was such a wonderful ceremony which truly celebrated him and his life, which anyone can attest that he lived to the fullest. 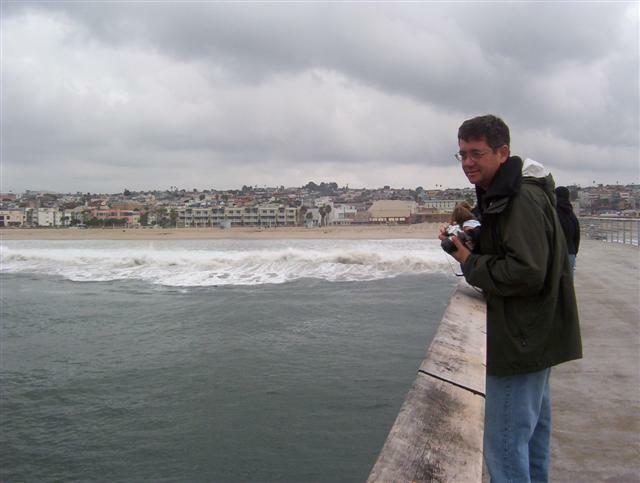 With this said, I would like to dedicated this post to my dear friend Russ who passed away on September 11, 2009 a few days shy of his 53rd birthday. His passing was a huge loss to those of us who knew him. He was a kind and generous soul. I met him on a camping trip in Catalina in September of 2005. Since then we shared many fun hiking, camping, and backpacking adventures together. He was the one who helped me purchase all of my gear, as he was the expert in the subject matter. We often carpooled together to the various hikes or camping trips that we went to. He always showed up to parties and never ran out of subjects to talk to people about, ranging from latest events, hole in the wall restaurants, sci fi, his travels, and his various hobbies. Those of us who knew him well, chuckled when he told the same stories to the new people that he met. Russ had a heart attack earlier this year, which came as a surprise to us because he was very active. He has spent the recent months taking it easy and recuparating. I take much comfort in the fact that I saw him at a mutual friend’s gathering 5 days before he passed. He tried the couple of Persian dishes that I had made and liked them both! I also take much comfort in having gone to his memorial service where a 150 seat room was filled to capacity with people standing in the isles. For once the four groups in his life came together: his family, his work collegues and friends, his dancing friends, and us, his adventure group friends. It was a wonderful memorial highlighted with two slide shows and many wonderful speeches by those who knew him. Now, onwards with the Halva recipe! 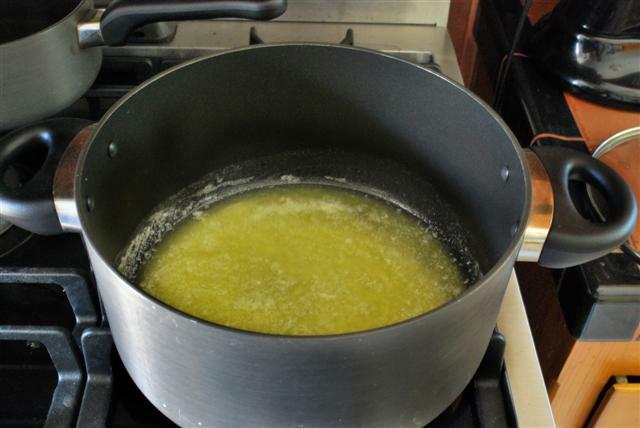 Melt butter in a non-stick pot. Let the flour brown on low heat making sure that you constantly stir so that it won’t burn. Think of this part of this recipe as the first stage of making Bechamel sauce or better known as Roux. It is imperative that you stay on top of it. 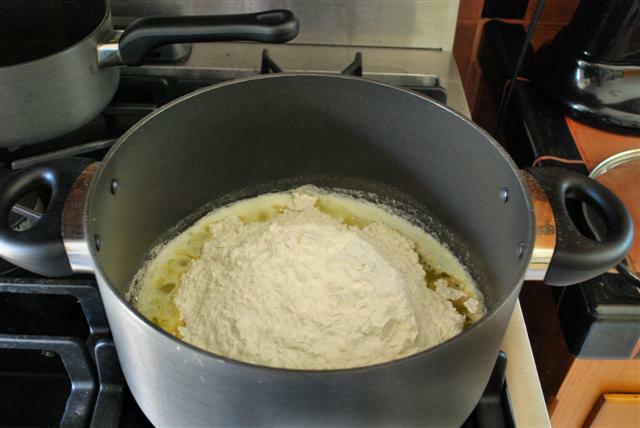 The color of the flour will gradually change to a light brown and also you will start smelling the cooked flour. This will take a while, so be patient. Once the flour is ready pour the syrup over it. Remove from hear and make sure that the roux and syrup are mixed well together. If it is too dry add 1/4 of cup of water to it. You will notice that the mixture has the consistency of a paste. Place paste in a dish and flatten it out with the back of a spoon. 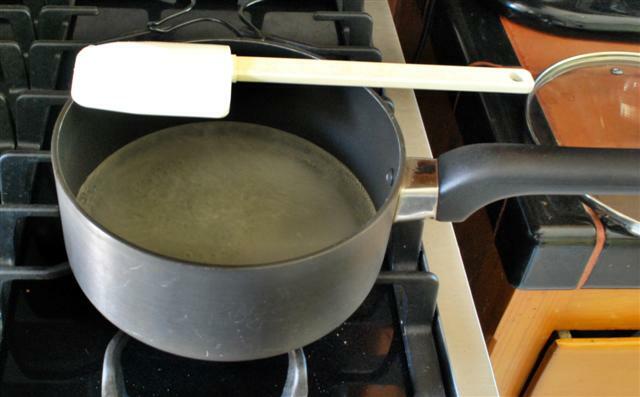 Decorate the edges as shown above by pressing the back of the spoon onto the paste. 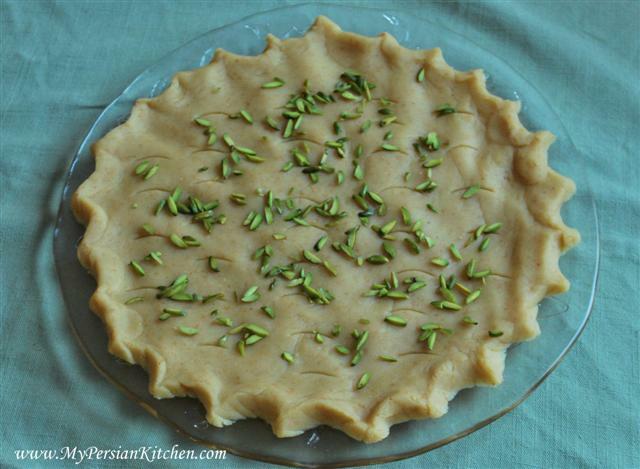 With the edge of the spoon make gentle indentations and then sprinkle with slivered pistachios. It takes a little practice to make the shape look nice. This recipe was enough for two platters: a big one as seen above, and a medium one seen in the first picture and the one above this one. Also the picture above was the first platter that I decorated. The second one definitely looks better. I just stumbled upon your blog, and I have to say that it is quite impressive. I am sorry about your friend’s death, and I’m sure it was hard to write about it. Thank you for your recipes and I will be visiting often. Nooschi, Good to hear you stumbled upon my site! Thanks for your kind words. I came across your blog a short while ago and love the food, pictures, and the name is genius! My condolences for your dear friend. Thank you for sharing the story. Just one comment regarding the Persian funeral. The typical Muslim funeral are as you described but other religion ceremonies like Bahai funerals are always accompanied by music, singing and chanting as Bahais believe that music is uplifting and is a ladder to the soul. I enjoyed reading your post even though it was about a sad event in your life. This man sounds like such a gentle soul. By the way, your halvah looks picture-perfect! Tasteofbeirut, you are super sweet. I really liked the color of the Halvah, it wasn’t too dark or too light!! I have tried making halvah 4 times as of now, my husband says its still not the right color or texture..but at least he thought the flavor was dead on this time. Kris, I am going to assume that you have made my recipe and it didn’t turn out. A few things, the type of flour and butter or oil that you use can make a difference. I was recently talking to someone who told me that she uses whole wheat flour, therefore hers comes out darker. A good halvah indeed should not taste like raw flour or should be lumpy. Try to cook the flour as long as possible until you smell a nut like aroma. Once you mix it with the syrup things get a little hard, but keep at it and add some hot water a little at a time if the paste is too dry. Try to make it as smooth as possible. Also remember that it will look and feel slightly different when you lay it out on a plate. I hope this helps. Let me know how it all works out for you. 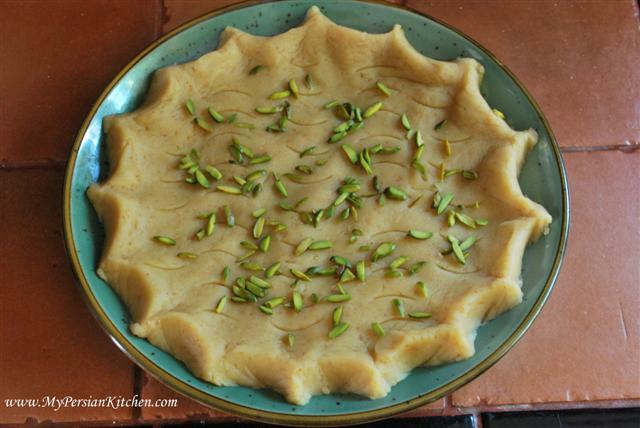 Actually I stumbled upon this blog after I have made it, I have made the recipe in the book New Food of Life by Najmieh Batmanglij…that one came horrible….my husband kept telling me his mom uses special flour but the recipe said to just use regular flour. When I went to the local Persian Grocery..the owner’s wife gave me her recipe which was totally different than the cookbook..which I might add is similiar but there are significant differences to yours. Besides that I have done research on the internet and some people toast flower and then add butter and oil and some people add the flour to the butter and oil…I have a feeling that one of these might create a smoother halva than the other….the all butter recipes make the halva too cakey…this current recipe called for 1/2 cup butter and 1 cup of oil to 2 cups of flour and 2 cups sugar to 2 cups of water..plus saffron , rose water and cardamon ….their are so many versions and I am just trying to get it to where he likes it.. 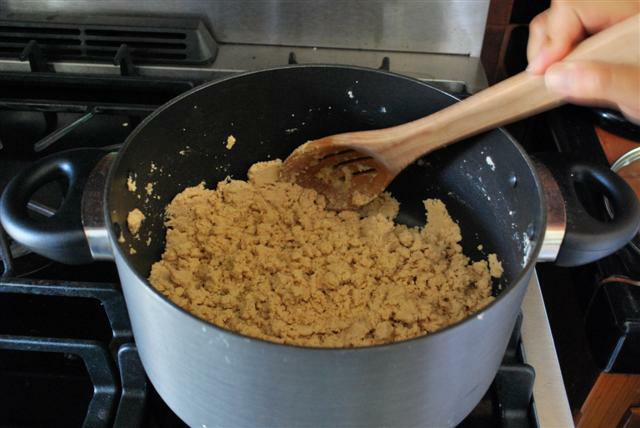 I am going to try your Kotlet recipe this weekend….it was a childhood favorite of my husbands…keep your fingers crossed !!!! Oh my Kris, what an adventure. Don’t give up though! Try making mine and see what happens. I don’t really know what else to tell you. Making Kotlet is going to be a breeze compared to what you went through with halvah!! Keep me posted! Kris, you go girl! Let me know what happens with the Halvah this time around! 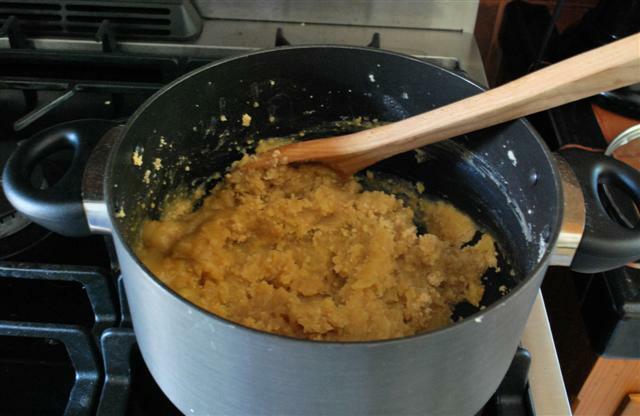 I’m very glad I found your blog through a link from Azita’s blog Tumeric & Saffron. And I am so sorry to hear about the loss of your friend. I also unexpectedly lost a dear friend to Crohn’s Disease a few months ago so I feel your pain. Oh my goodness, I totally bypassed the part where you said halvah is usually associated with funerals in Iran! I guess I don’t want to send halvah to my friends then! Oops! Karen, thank you for your kind words. I would not suggest mailing halvah as it’s delicate and can go bad. Great blog! I love halvah. Do you happen to have a recipe for sohan? Lulu, I have never made sohan before, but I will put it on my list of requests to make it! I really enjoy your site- just found it and truly was sucked in. That was a great writeup about your friend. Unfortunately, the video at the end does not work. I’m looking forward to seeing and trying more of your recipes. Sarah, welcome! Thank you for your kind words. Darn, I am so bummed the guy removed the video. It was hilarious! The color of this halva is definitely not all the way done! Looks too light! 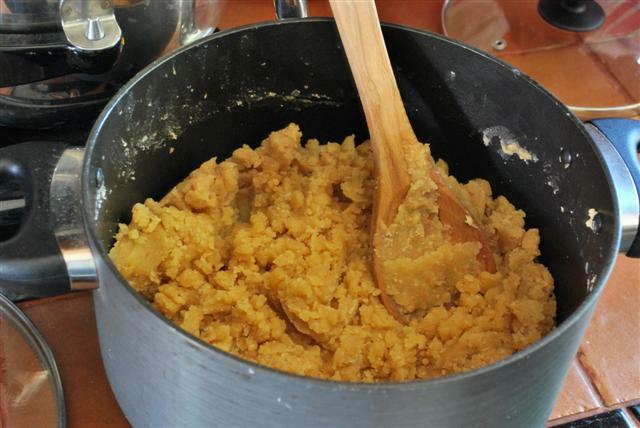 A good and tasty halva should be darkish brown. Btw, I do think all the exaggerated crying like is mentioned above at Mid-Eastern funerals all a put on act to show everyone who loved the deceased more – my Persian friends told me that you can even rent-a-crowd to do all the crying so people would think the deceased was so widely loved! And the funny thing is it’s not even Islamic to wail, moan, beat oneself, tear clothing etc yet some people do it. It would seem to a child very disturbing indeed! Beautiful recipe. Love making this. Brings back happy memories of my childhood in Iran. Thanks! The recipe above does not indicate the quantity of rosewater required “1 1/4 rose water”. I would appreciate it if you could please let me know how much you use. I just tried this recipe and everything went well until I added the syrup. Instead of a paste I got a soup! I continued to stir on low heat but I never got to a consistency that matched the pictures. I followed the recipe and directions exactly so I am not sure what went wrong. I’d like to try this again for my boyfriend’s family, he is half Persian and I love cooking for them. Hi can i skip the saffron and butter? Jay, no as they are important elements of this recipe. Could you please clarify the amount of rosewater used? 1 1/4 teaspoon? Or tablespoon? Thank you very much! OMG you forgot to write 1 1/4 (??????) rose water…cup? what? for a beginner like me I’ve tried 3 of ur recipes so far (kuku sabzi, ash reshteh, kofteh berenji, and about to make halva) and they all burned or tasted like crap except the ash that was a miracle…it’s not you, it’s me…i know it. I hate how i am craving momon bozorgi things! Maryam, oops my bad! I am sorry your food burned. Don’t give me. I have burned many things before I got them right!!! Sanam jan, I stumbled upon this old post doing a little halvah research and I’m so glad I did. I’m grateful that you shared your memories of memorial services back in Iran — I’m glad I live in a time that that kind of information is so easily accessible, and I have you to thank for that! I have similarly negative childhood memories of Persian memorials — so very somber — but I must admit the halvah was always a bright spot. Yours looks and sounds delicious. 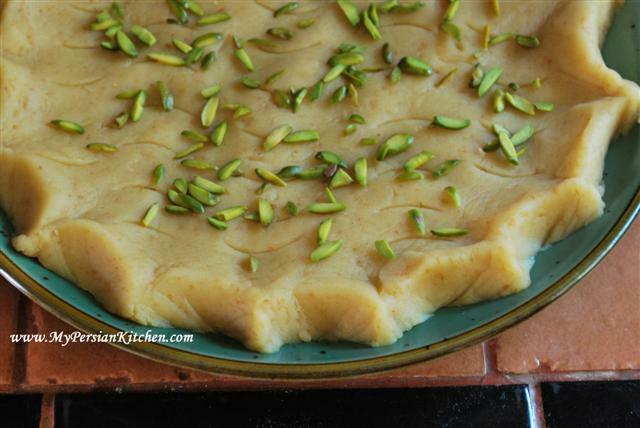 I just came across this old post frantically searching for a Halva recipe. I am not Persian, but we live in an area that has a high population of Persians and Armenians, so lucky for me we have these amazing little markets around here. Do not even get me started on my obsession with Sumac!! But my 11yr old daughter LOVES Halva, and it is not cheap to buy, so thank you!!! I had no idea that this is something served at funerals. At our funerals, well mostly the Mormon side of the family, Funeral potatoes are always served, and let me tell you, they are the yummiest comfort food ever. It always bothered me that they were only served at funerals. So I make them when ever I want;) If you ever want the recipe let me know. Sorry for the loss of your friend, what a wonderful story! I love how you met in the shower! Ha! Ha!! That’s a fabulous story!! Jana, I love potatoes, it doesn’t matter in what form!!! I had no idea they are served at Mormon funerals.